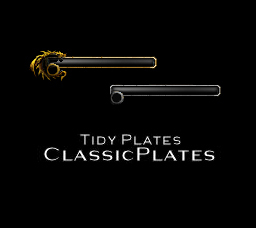 Simple name plates theme for Tidy Plates using both elite and normal frame graphics from player and target frames for those who enjoy original graphics or simplicity. Blends in well with most addons and it´s fully compatible with Tidy Plates Hub!! ClassicPlates won´t work if Tidy Plates is not installed. All settings must be changed on Tidy Pltes Hub. Here is a ClassicPlates configuration guide. Credits to its author. Please report any bugs or issues with ClassicPlates on the comments below. Thank you all. -Special thanks to Asethien. It´s his creation. Hoy! Do you plan to make your addon compatible with Tidy Plates continue project? Actually im not playing so no. I also belive no change is needed to load it on since original TP did just loaded them. Maybe something going on on the TPC version. Since TP Continued is a "fix" of TP it "should work... fine?" But i tested fixing TP manually and worked flawless. Hi. i´m actually not playing but as it looks so broken i´ll check it. Hehe this is a VERY old message. Strangely the original issue still exists. Although someone else picked up your project I assume I thought I ask if you still going to fix it or not? Yup. It´s an option. Atm "Use default Blizzard Font" option does the trick as well which is exactly the same. Since 7.0.3 i´ve noticed many non latin countries (Asia, Ru, and some lrtl) are prefering BlizzardPlates just because it uses default blizzard fonts packed on the game which gives them "language minor compatibility" instead of those ????. This may also be the reason why some people also uses ClassicPlates with default Blizzard font and some other cause they just dislike Alice font (which is original font i inherited the addon with and will remain as it). This last case had made me wonder if i should add an alternative .lua with blizzards fonts. Good thing is knowing that non latin people also wants/like some addons but are limited to them due to language itself or addon braking fonts. I personaly had not thought about it before. Yup, has happened to me too on BlizzardPlates. Sometimes it will come back just by moving camera away from them and looking them back. Dunno if someone can confirm it happening on stock plates or if it's just a TP Core bug atm but i'll really dig into it when a TP release is launched unless a critical error or it's really needed. Yep, it's fixed x3 Mob interuptable casting bars seem to be working fine now! It could be like the game not exactly knowing what level they are? Because Bosses are Bosses regardless, so the Skull icon remains. But ?? Elites and ?? targets are just... unknown? Should be fixed on v2.4c. Hello! It's oki x3 Yeah I tried reinstalling and reseting the data for the addon, still the same, I haven't changed any of the data. Sorry i missed this today. I'll be checking it tomorrow morning. Try reinstalling ClassicPlates if you edited the lua file. However I have another issue about interruptable casting bars, they border and the bar/icon itself are not overlapping, but they are stacked over eachother like the pic below. It works fine for uninterruptable casting, but when there's ones you can interrupt it appears like that. And it only happens with the Classic plates version. Yup, it is broken. You can check the note i left on ClassicPlates description explaining whats going on.